Beautiful condo! Great location! Great reviews! Great condo located on west end of beach. One mile to Pier Park and Frank Brown Park. Come see why we get rave reviews and repeat visits from our guests. Super clean, comfortable condo with full amenities. We furnish everything, including sand chairs and beach toys. The condo features 2 bedrooms with queen-size beds and 2 full baths upstairs. Downstairs is full kitchen/dining/living room and a half-bath. Off the living room is a patio with gas barbeque grill, umbrella/table/chairs. Washer/dryer inside unit. 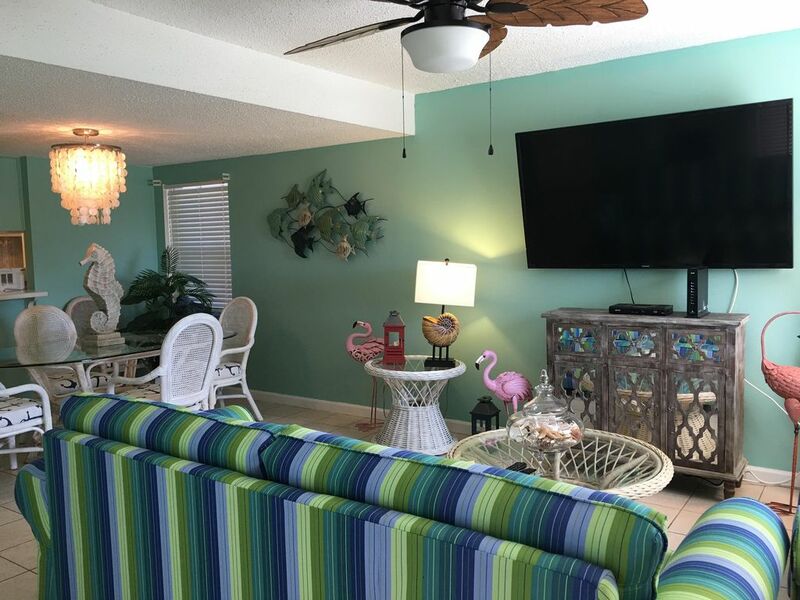 The condo is located in the center of the complex across from main pool area with just a short stroll down to the beach. The complex has four pools (one kiddie pool), hot tub, mini-golf, tennis, basketball and shuffleboard court. We welcome you as our guests! Hello, We are the Peacocks, Bryan and Kristina. We are so glad that you have chosen to stay with us in our condo. We have done many upgrades and look forward to more in the future. We hope your vacation is relaxing and filled with great memories. Peacockshorizonsouth.com is our website. Check it out! 5-minute walk to beach. 1 mile to Frank Brown Park. 1 mile to Pier Park shops, pier, and entertainment. Great complex with 4 sparkling pools, very nice hot tub, well-maintained tennis courts, mini golf and shuffleboard for fun and relaxation. Free wifi. Each bedroom has full bath. Downstairs living area has a half-bath. Come enjoy the magical wonderment of Panama City Beach. Whether you are para-sailing, coastal sailing, surfing, or just walking the beach, your surroundings are vistas of sugar-white sand for miles along the shore. Horizon South complex is located within a mile of our newest shopping area Pier Park. Also, the condo is within a mile of Frank Brown Park, where national softball tournaments are held.